All your teenager wanted for Christmas was a part in the next “Twilight” movie. Since the first two films in the “Twilight Saga” series, “Twilight” and “New Moon,” have been released and the third, “Eclipse,” has been shot, teens all over the world are getting desperate. Their last chance to be the kid sitting in the back of the lunchroom, or the teenager behind the counter of the coffeehouse, or even the brown dot on the horizon in a crowd scene, could soon be gone. So your teen jumps on the Internet and starts searching for audition opportunities. Or your daughter, who belongs to a “Twilight” fan site, gets an e-mail out of the blue from a “casting scout” for “Breaking Dawn,” the fourth film in the series. Lana should know. 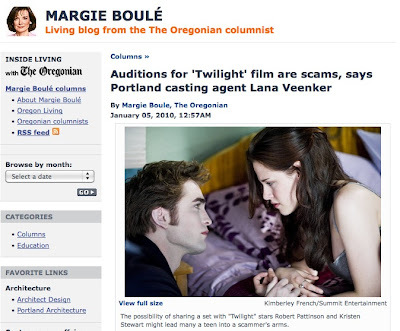 Not only is she a legitimate casting agent, but she’s also the casting agent who gave people real parts in the first “Twilight” movie, which was shot in Oregon and Washington.